Handicappers in sports books in Las Vegas, who make a living doing such things, projected the “over under”, or yearly win potential total, for the 2017 Saints at 8.5. The number suggests the team could have a winning season and contend for a playoff spot. This is an eye opener since there have no dramatic acquisitions in player personnel or coaching staff changes to suggest it. In fact, one could say there have been net talent deletions, with receiver Brandin Cooks dumped off to New England because of an apparent attitude problem, and defensive tackle Nick Fairley unexpectedly lost to a non football health condition – right on the heels of a large new contract that promptly became yet another waste of salary cap space. Vegas has soothsayer street cred though, having been on the nose with the Saints projected win total at right about 7 the past three years, which is where they finished, to the repetitive and tease dismay of fans of the team. The 1.5 game differential is thus bigger than it looks, intimating the Saints will not have crapped out of the playoff race again by Thanksgiving. What gives? If not the deepest, the NFC South is as deep as any division in the league. Atlanta just got back from a Super Bowl, Carolina ditto the season before that, and Tampa Bay has been assembling young talent while their esteemed quarterback, Jameis “Frog Legs” Winston, has accumulated experience. If Hurricane Irma does not do too much collateral damage in the way of distraction, the Bucs are poised to be this year’s Cinderella of the conference. 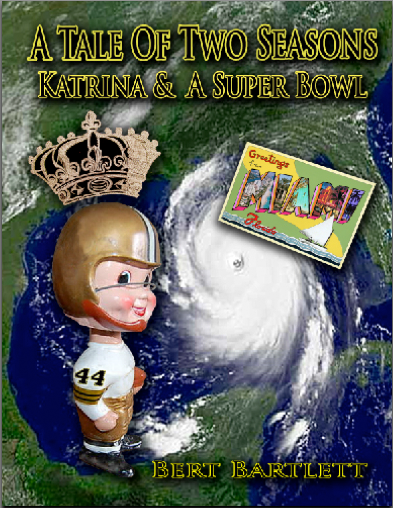 It’s imperative New Orleans does not get off to another dismal start, a la Zero & 4 or One & 3. There is too much parity in the NFL to afford that, and the tried and true formula here for those kind of starts has been to scratch up to the surface to break even, only to have blown their wad in doing so, with nothing left in reserve for when the games really get to matter. Indeed, the 2009 team slogan Finish Strong has been dusted, replaced by Start Respectably! The first quarter of the schedule is critical, and will be telling. A win on Monday night in Minneapolis is doable and would help in spades. Poydras St. should be raucous when the Patriots visit, which may help the home team as live underdogs. In Carolina the Saints will need luck to come out on top, and by the time they get to London to play Miami, everybody could already be exhausted. A Two & Two beginning to the season would be a moral victory for all of Nola. Veteran Ted Ginn Jr. was brought in from Carolina to replace the deep threat that was the aforementioned Cooks. Ginn can get vertical alright but has unreliable hands, putting it kindly. Sure enough, he dropped his first pass as a Saint, an easy short toss in the chest for a touchdown in the exhibition in Cleveland. Ginn may be more valuable returning punts, assuming utilized doing that. The Saints haven’t had a meaningful punt / kick return game since Reggie Bush. While possession receiver Willie Snead sits out for three games on a DUI suspension, and Brees adjusts to reading coverages without Cooks stretching them, ascending second year man Michael Thomas will see the load of the throws, from all over the field and in any situation. Thomas is talented and versatile enough to become elite and an All Pro in 2017. And the young and tall Brandon Coleman has an opportunity to perform like a poor man’s Marques Colston (sans the propensity for late career drops). The league is loaded with short defensive backs, and Coleman is an enticing target for height mismatches. Number 16 has been a project and has come along, albeit slowly. This September is definitely his time to formally arrive, particularly as opponents double up on Thomas. Talk, or hope, of a more balanced offense here has mostly been whistling Dixie for years. Yet that may change in the first month or so, even if by default, while the passing game fires on alternate cylinders. We don’t know yet if the aged Adrian Petersen has any fine wine left to offer the run game committee, still chaired by Mark Ingram. But it appears Tennessee Volunteer rookie Alvin Kamura (#41) can bring stuff to the party. He hits the hole quickly, and is a glider, the kind of back that can make an immediate splash in the NFL – if he doesn’t over think it. And fullback John Kuhn was a nifty acquisition from Green Bay. Though in his twelth season, the guy can do pretty much what’s asked of him, be it grind for inside yards, block, and is an under the radar, useful swing receiver out of the backfield, playing an all but extinct position in today’s pro game. Kuhn is definitive Old School, fun to see out there. Coach Payton may have more ball control game plans up his sleeve than a preponderance of aiming for Brees to sling it for 400 or 500 yards, and hope for the best. Regardless of what Vegas thinks, what remains certain is that the ’17 Saints will go as far as their defense allows them to. There are some signs that this may finally be the year the unit swims up from bottom of the barrel rankings. It’s been obvious here for a long time that if the defense were comparatively just middle of the pack, the team’s fortunes would gap up. Coordinator Dennis Allen said a primary goal was to upgrade the linebacker corps. Help may have come from Manti Te’o, via the Chargers, who had a stellar stint at Notre Dame, but was last famous for having a phantom girlfriend on the internet. He looks like a fit so far though, in a steady eddy kind of way. Craig Robertson (#52) is in his sixth year out of North Texas and made his presence known last season, emerging as a leader of sorts with his playmaking and enthusiasm. Stephone Anthony (Clemson) is a head scratcher though. He had a good rookie season in ‘15 but has been invisible since, perhaps in the coaches’ doghouse for something or other. But he has some talent and is still on the team. The unit’s gem is clearly sophomore tackle Sheldon Rankins (#98). Big can be a euphemism for fat in football, but the 300 pounder out of Louisville is the former, quick off the ball, and capable of wreaking havoc. Summer had him looking in great shape. Like Michael Thomas on offense, he has elite and All Pro capability. Wherever from, the Saints have to graduate from the school of powder puff pass rush they have been attending, for what seems like an eternity. Allen will mix up the personnel and call his share of blitzes. Safety Kenny Vaccaro may have an interesting season. He is more effective roaming the line of scrimmage than back in coverage, like Roman Harper used to be. And he has a nasty streak, which is fine. Vaccaro could be among the names atop the sack list. Whether it’s from Robertson, Rankins, Vaccaro, or whomever, it would be refreshing if the leadership figures on this year’s outfit are on defense. Where is it inscribed that quarterbacks have to be those? Jay Cutler may have been better in Chicago if the fans and media had not kept nagging and ragging him about it. When the Ravens won their first title, Ray Lewis and his cohorts were the heart and soul of that team, not Trent Dilfer. Besides, Brees may appreciate a break from that spotlight, as we would from the patented answers. If the defense gets good, we will need a nickname to ride with. Nothing ominous like the old revered Dome Patrol will fit, but Gnome Patrol might if the defense is a pest to its opponents. Or maybe The Rubber Bands, if in the red zone, they get acute at holding foes to field goals more than touchdowns. Pro football has more than its share of fundamental problems and turn offs – a growing share contend it has peaked in quality as well as popularity – but the new season feels a tad extra welcome, even if only because of the respite it can provide from the all out media blitz that has been The Trump Show. Bearishly, Sports Illustrated just picked the Saints to get six wins and pull up the bottom of their division. But that’s no cause for alarm; the mag predicted the same spot in ‘09, before the Black & Gold all got rings. Godspeed to all those adversely affected by Hurricane Harvey. Katrina memories got too lucid. Fingers crossed on Irma. Interesting analysis… Spot on, Bert. This may be the key line in your piece… at least for the first quarter of the season. There’s no question the Saints have the pedigree to score. Sean has ingrained that quality in the team’s DNA… but they have to figure out a way to prevent the opposition from scoring more than 30 points every game. It’s too much to expect Drew to sling the ball 40 to 50 times every outing. Play a little D and maybe Sports Illustrated will eat a little crow next February. Keep up the good work. I always learn things when I read your pieces. Hi Bert, thanks for bringing me up to speed on new talent. Congrats on your 9th year! Have you read “Interference” by Dan Moldea? An interesting read which ties in with the handicappers prognostications out west. Drop me an email to share contact info. Lots to catch up. You have kepr tab on the Saints snd I have have been keeping tabs to the Aggies.